You need to work hard in the spring to the summer to get a bumper crop of strawberries. This garden plant is one of the most demanding and time-consuming to clean, so for the emergence of delicious berries strawberries should correctly handle. The success of a rich harvest, first of all, depends on the correct execution of the works in the beds. Gently rake up all of last year's foliage. In any case, don't burn the leaves produced during the burning of dry vegetation dioxin – hazardous substance. Proryhlit the soil in between rows and rows. Then do the fertilizing strawberries. Early spring strawberries , fed by special fertilizers, for example, "NPK" or organic complex (diluted infusion of mullein or chicken manure). 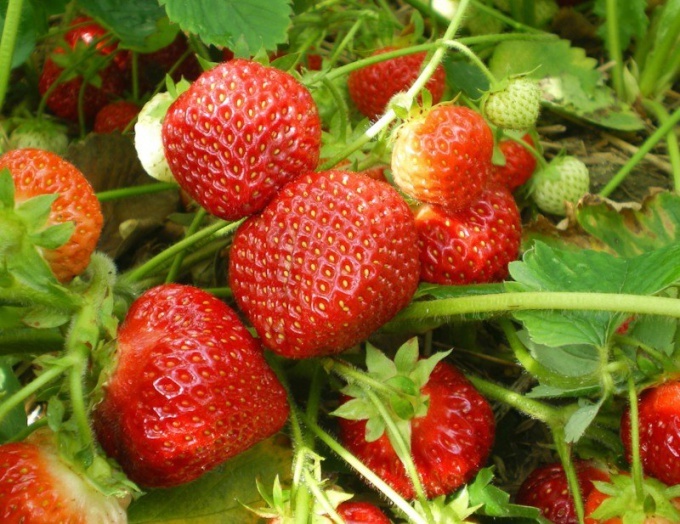 Fertilize strawberries directly under the root rate of half a liter of solution every tree of the garden plants. To combat pests and diseases treat strawberry special preparations: "Phytosporin" (a fungal disease), "Colloidal sulfur" (powdery mildew) or similar. Watering strawberries throughout the growing period, and especially watering when the garden culture in bloom and during fruit ripening. Preferably the strawberries to pour the cool water in the morning. After each watering and feeding loosens the ground. In addition, during the entire vegetation period, fight the weeds, removing them on time, and be careful to avoid earthen crust. In the process of Bud formation and during fruit ripening strawberries in need of potassium. In this period for feeding: you can use a diluted solution of chicken droppings, fly ash, or potassium nitrate. Mustache on the strawberries begin to appear immediately after the flowering of this garden culture. The maximum number occurs for the period of complete fruiting. At this time, and trimming mustache. Mustache crop of strawberries in the morning or evening, it is desirable that the day was dry. Follow ordinary garden pruning shears. Moustaches of a strawberry it is not necessary to break off: they are tight, so pulling the heads, you can damage the main hive. Mustache can be used as planting material. In this case, three root sockets of the first order going from a parent plant strawberries. To use as planting material outlet of the second and subsequent orders are not recommended: this will negatively affect the yield of strawberries. Using for combating pests and diseases certain chemicals, make sure that you comply with the dosage (it is listed in the instructions to the drug). Overdose can cause the death of garden plants. The kidneys of the stems of the strawberries should not be covered as this can cause rotting bushes and their subsequent death.